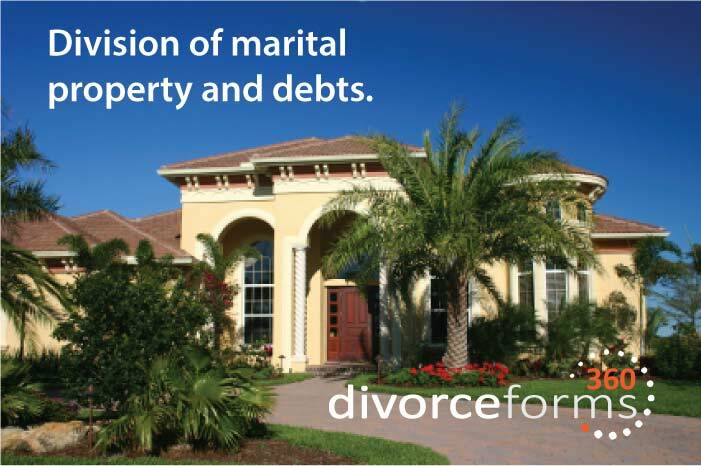 In most divorce cases, the property and debts of the marriage are divided by a mutual agreement between the spouses. Sometime when a divorce is filed, the spouses have lived apart for so many years, that everything has already been split. It certainly is best if the spouses can agree on a fair division of the property and debts acquired during the marriage. The spouses will typically know what property they value the most and typically can reach an agreement on how to split the property. "Community Property" and "Equitable Distribution" States. If the parties can't agree on the division of marital property, the courts handle property division in two general ways. They divide the property pursuant to the laws of a "community property" state, or based on "equitable distribution". A community property state will use discovery to determine all the property and debts that were acquired during the marriage, assign a reasonable value, and split the property equally. In a community property state, the court will determine which property is community property and which property is separate property. In an equitable distribution state, the court will use discovery to determine the property of the marriage, assign a reasonable value, and divide the property on what it determines to be most fair. When property is divided pursuant to equitable distribution, this doesn't necessarily mean equal distribution of marital property, but rather a division on the basis of what the court deems as most fair to both parties. How does your State divide marital property. The States that are "community property" states are: Alaska, Arizona, California, Idaho, Louisiana, Nevada, New Mexico, Texas, Washington, Wisconsin and Puerto Rico. In these States and Territory, the marital property is divided equally. All other states are "equitable distribution" states, and divide the marital property according to what the Judge determines as fair, or equitable. Determining what is Marital Property. Almost every marriage has what is referred to as "marital property". Marital property is basically any property acquired by either spouse during the term of the marriage. There are exemptions to this, but basically everything that the spouses purchased during the marriage is marital property. In the same sense, the debt's acquired during the marriage are marital debts. In a divorce proceeding, the court really only has authority over what it determines as marital property. Non-marital property, which is property a spouse brought into the marriage and has kept separate, is non-marital property. Prenuptial agreements are commonly used to make certain what property brought into the marriage will remain separate, or non-marital, in the event of a future divorce, or the death of one spouse. Can separate, or non-marital property be converted to marital property? It is important to understand that in most States, if you have separate property and don't keep it separate, it can be deemed later as marital property. For instance, if you own a home prior to the marriage, and then refinance the home and put your spouses name on the deed, then the home is now usually determined to be marital property. Also, if you receive an inheritance and deposit the money in a joint checking or savings account, the court could now deem that money as a marital asset.